I’m sick of all the disagreement over the use of nauseous (snicker). 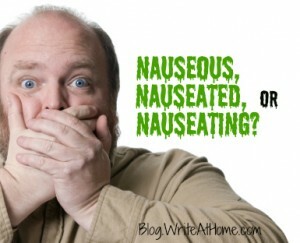 For some time, word sticklers have insisted that the two terms be clearly differentiated — that only nauseated means “inflicted with nausea” and the definition of nauseous is restricted to “causing nausea.” So, it would be correct to say The fumes are nauseous, but not, I feel nauseous. But this strict prescription is shaky on several levels. According to Dictionary.com, nauseous was used in both senses from its first appearance in the early 17th century. So, you can’t point to historical usage or original meaning to support the restricted definition of nauseous. All major dictionaries list both definitions for nauseous, some with “inflicted with nausea” as the primary definition. This includes Dictionary.com, Merriam-Webster, American Heritage, and the OED. All of these include usage notes addressing the controversy and all agree that nauseous can mean either causing or experiencing nausea. American Heritage’s online entry includes an interesting, detailed note on their Usage Panel’s consistent move toward accepting the “inflicted by nausea” definition over the decades. Back in the 1960s, they overwhelmingly opposed a sentence like Roller coasters make me nauseous. By 1999, 61 percent of the Usage Panel accepted it. Today, agreement would be close to unanimous. Remember–this is the opinion of scholars, editors, and writers. Of course, the most persuasive argument for accepting the “experiencing nausea” definition of nauseous is the fact that the great majority of Americans use it in this sense most of the time and have done so for decades. Final verdict: Both This soup is nauseous and This soup makes me feel nauseous are acceptable. Your cologne makes me nauseous. Your cologne makes me nauseated. If you have any comments or suggestions, please leave them in the Reply section below.